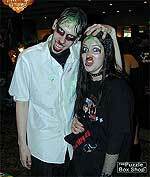 Here are a few photos that were taken the weekend of Monster Mania 5 in Cherry Hill, NJ 2006. Thanks to ALL who stopped by and said hi and a BIG thanks goes out to any of you who purchased your box from us at the show! Below you will see a few photos of some of the people that came by in make-up and of course the Cenobites! Doug Bradley, Simon Bamford, Nick Vince, and Barbie Wilde. You will also see photos of Ashley Laurence and the FX master Gary J. Tunnicliffe.